Canada is one of 28 Countries that offer asylum to asylum seekers at its border and can easily make a case for the most immigration-friendly nation in the world. In 2017, 50,420 people came to Canada seeking asylum, the highest Canada has seen in at least a quarter century. Not only is Canada receiving more asylum seekers than in years past, but they are being let into the country at higher rates than years past as well. According to a CBC investigation, in 2017, 70% of asylum seeker claims were successful. Acceptance rates Canadians have not seen since 1991. Canadian Immigration Policy states; “Individuals can make an asylum claim in Canada at a port of entry, at a Canada Border Services Agency (CBSA) inland office or an Immigration, Refugees and Citizenship Canada (IRCC) inland office. CBSA or IRCC officials will then determine if an individual is eligible to make an asylum claim”. Asylum seekers must meet strict criteria before their claim is deemed successful. It is important to understand the difference between asylum seekers, refugees and immigrants. Canada welcomed 1.2 million immigrants between 2011 and 2016, according to a 2016 census. Canada let in another 272,000 in 2017. Justin Trudeau and the Liberal government announced an immigration plan to welcome 340,000 more immigrants per year by 2020. Canada took in a record number 46,700 refugee’s in 2016. Approximately 33,000 of those from war-torn Syria. The vast majority of these new immigrants (39%) moved to Ontario and of that 39%, approximately 75.6% moved into Toronto. Adding up to approximately 356,930 people between 2011 and 2016. Currently, 344 of these asylum seekers (96 Families) are being housed at Centennial College. With the start of the fall semester on the horizon, these people are still without a permanent place to stay. As of late June, there were 3,304 refugee claimants in the shelter system, accounting for 47 per cent of its users, according to the city. More than half of them are part of a program for refugees in college residences and hotels. The federal government has offered Ontario $11 million dollars to offset immediate housing costs, but the provincial government said that will only cover a fraction of the costs amassed in Toronto alone. Showcase Toronto reached out to Centennial College to get more information on the current situation at hand for these asylum seekers but received a very discourteous response. It seems as if Toronto will be able to weather this storm but at this rate we are bound to incur more and more issues. Maloney, Ryan. “Canada To Welcome 340,000 Immigrants A Year By 2020 Under Liberal Plan.” HuffPost Canada, HuffPost Canada, 2 Nov. 2017, www.huffingtonpost.ca/2017/11/01/liberal-immigration-plan-canada-to-welcome-340-000-newcomers-a-year-by-2020_a_23263829/. “Sweden Was among the Best Countries for Immigrants. That’s Changing.” Public Radio International, PRI, www.pri.org/stories/2017-09-11/sweden-was-among-best-countries-immigrants-thats-changing. “2017 Immigration Levels – Comments.” A Hundred Years of Immigration to Canada 1900 – 1999 | Canadian Council for Refugees, ccrweb.ca/en/2017-immigration-levels-comments. Puzic, Sonja. “Fact Check: Do Refugees Get More Financial Help than Canadian Pensioners?” CTVNews, 1 Dec. 2015, www.ctvnews.ca/politics/fact-check-do-refugees-get-more-financial-help-than-canadian-pensioners-1.2670735. “What Are the Easiest Countries to Immigrate to?” What Is the Difference between SAP HANA and s4hana? – Quora, www.quora.com/What-are-the-easiest-countries-to-immigrate-to. “Why Is Canada the Most Tolerant Country in the World? Luck.” The Globe and Mail, The Globe and Mail, 11 May 2018, www.theglobeandmail.com/news/politics/why-is-canada-the-most-tolerant-country-in-the-world-luck/article19427921/. Geiger, Abigail. “Number of Asylum Applicants in Canada Spiked to More than 50,000 in 2017.” Pew Research Center, Pew Research Center, 13 Apr. 2018, www.pewresearch.org/fact-tank/2018/04/16/asylum-claims-in-canada-reached-highest-level-in-decades-in-2017/ft_18-04-13_canadaasylum_annual/. Citizenship Canada. “Notice – Supplementary Information 2017 Immigration Levels Plan.” Canada.ca, 31 Oct. 2016, www.canada.ca/en/immigration-refugees-citizenship/news/notices/notice-supplementary-information-2017-immigration-levels-plan.html. Puzic, Sonja. “Record Number of Refugees Admitted to Canada in 2016, Highest since 1980.” CTVNews, 24 Apr. 2017, www.ctvnews.ca/canada/record-number-of-refugees-admitted-to-canada-in-2016-highest-since-1980-1.3382444?autoPlay=true. “Number of Refugee Claimants in Canada 2000-2016 | Statistic.” Statista, www.statista.com/statistics/549323/number-of-refugee-claimants-canada/. Carman, Tara. “Canada’s Acceptance Rate of Asylum Seekers Is the Highest in 27 Years – Here’s Why | CBC News.” CBCnews, CBC/Radio Canada, 7 Feb. 2018, www.cbc.ca/news/canada/asylum-seekers-overview-data-1.4503825. Citizenship Canada. 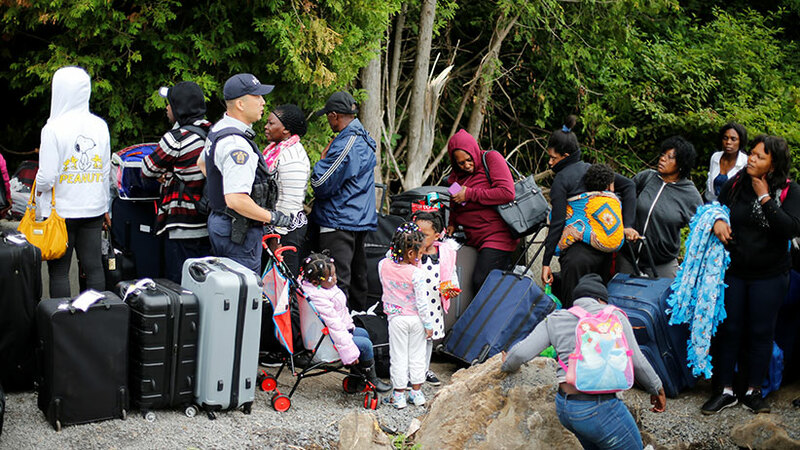 “Asylum Claims.” Canada.ca, 15 June 2018, www.canada.ca/en/immigration-refugees-citizenship/services/refugees/asylum-claims.html. Scotti, Monique. “Tories, NDP Call for Emergency Meeting on Asylum Seekers.” Global News, Global News, 11 July 2018, globalnews.ca/news/4325434/asylum-seekers-border-emergency-meeting/. Ministry of Finance. “2016 CENSUS HIGHLIGHTS: Factsheet 8.” Ontario Fact Sheet April 2018, Ministry of Finance: Government of Ontario, www.fin.gov.on.ca/en/economy/demographics/census/cenhi16-8.html.